Sixty Acres and a Bride was a very well-written, engaging story. Right from the prologue, I knew it was a western-style story inspired by Naomi and Ruth. 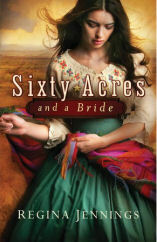 You can read my full review of Sixty Acres and a Bride here on Amazon or Christianbook. If you find my review helpful, consider clicking the yes/no helpful buttons for me! Thank you to Regina and Bethany House through CFBA for sending me a copy to read and review!